Here comes an understatement: times are tough for the Vancouver Canucks. The team finds itself third in the underachieving Pacific Division with a 12-14-9 record. They’ve lost four of their last five games and were shutout twice in that timeframe. Henrik Sedin is injured, which has exposed the weaknesses across the roster. They’ve been defensively porous and they lack the high-end skill a team in today’s NHL requires to make it happen. Vancouver has scored 89 goals so far, but they’ve allowed 102. They’ve left Ryan Miller hanging multiple times a game, which has resulted in a .909 save percentage and a 2.74 goals against average. 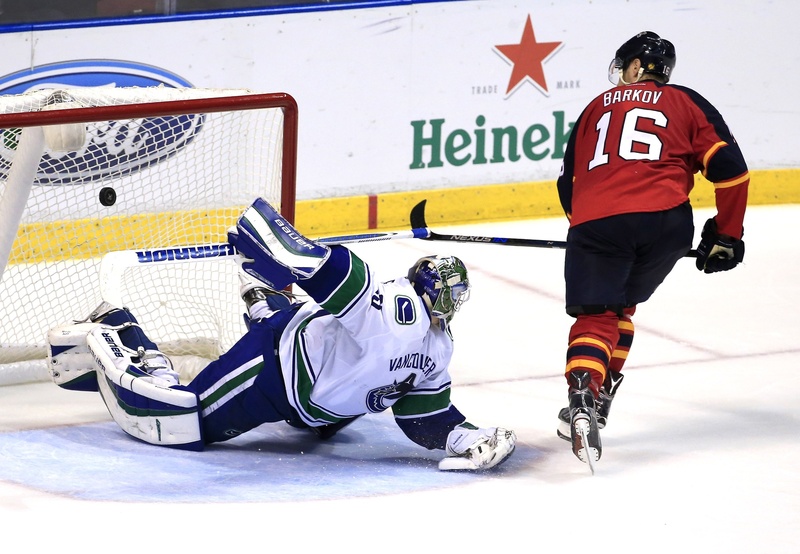 Jacob Markstrom hasn’t fared better, going 1-3-3 with a .911 save percentage and a 2.76 goals against average. Predictably, the Sedin twins lead the club in scoring. Daniel has 35 points in 35 games, while Henrik has 31 points in 33 games. Back on December 6, we discussed how the Canucks have made life easy for the opposition. That hasn’t changed and it likely won’t. It’s hard to argue that this roster, the one compiled by Jim Benning and Trevor Linden and their transformative ways, is going to change Vancouver’s fortunes any time soon. It’s true that the Canucks can and will get more years out of the Sedin twins. They should ride the train into the sunset, quite frankly, as they’ve often been the only elite players on the team. As long as they continue to perform at a high level, Vancouver will at least be in the position to create chances off of quality puck possession. It’s also true that the future looks bright. Jared McCann, Bo Horvat, Ben Hutton, and Jake Virtanen represent a solid core. McCann has risen to many challenges thus far, putting up points and anchoring the second line. He’s looked good filling in for Henrik, too, and he can create offensive chances while making life interesting for the opposition. But while there are highlights to be found in the Canucks roster, there’s less to be desired when it comes to the big picture. This is a team that lacks that “compete” factor on most nights, even when they do cobble together goals. They look languid, uninterested. They lack unity. They’re often out of position in their own end, which is a result of their abysmal defensive group. Outside of Alex Edler and Hutton’s potential, there’s little to cheer about. For now, they’re in the middle of nowhere. Because the Pacific Division is so weak and because of the NHL’s new seeding rules, they stand a chance of making the playoffs. They’ll likely get eaten alive, but the experience could give the likes of McCann and Horvat valuable playing time. And that could be the silver lining here, especially as the team continues to stumble in search of its identity. Previous What Should the Oilers Do with Justin Schultz?